The pungent whiff of marijuana can frequently be encountered during strolls past Tel Aviv’s sidewalk cafes, and whether its recreational use should now be legalized has become an unexpected issue before April 9 elections. Equally as unexpected is the party that has brought the issue to the forefront: the far-right Zehut (Identity), led by former lawmaker Moshe Feiglin. Feiglin’s unusual combination of Jewish religious nationalism and libertarianism has drawn in a strange mix of voters, from young weed smokers to right-wingers attracted by his extreme views on the Israeli-Palestinian conflict. Campaign photos featuring him with round glasses, a closely cropped beard and a black turtleneck bear an unmistakable resemblance to someone who would likely be on the opposite side of the ideological spectrum: late Apple founder Steve Jobs. To accusations that he is exploiting marijuana legalization for political gain, Feiglin has a simple reply. “If it’s true, so what?” the 56-year-old former lawmaker in Prime Minister Benjamin Netanyahu‘s Likud party told AFP. 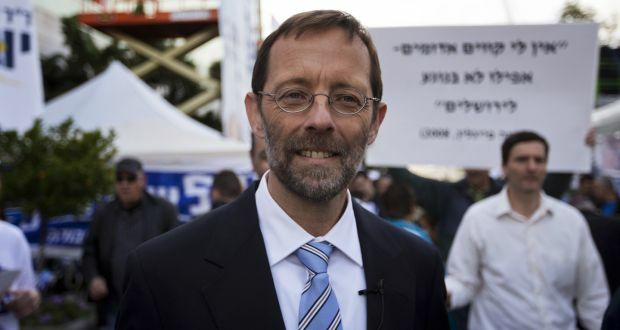 The most recent opinion polls forecast Zehut winning around five to seven seats in Israel’s 120-member parliament, meaning Feiglin could form part of the next governing coalition. The party’s rise has led to something of a contact high. Others have jumped on the issue, with even Netanyahu brandishing his marijuana bona fides. Talk of marijuana legalization is not entirely new in Israel, and enforcement for casual smokers can be light. In certain bars and cafes, it is smoked more or less openly. In 2017, Israel’s public security ministry partially decriminalized recreational marijuana use, setting fines and treatment for initial offenders instead of criminal procedures. The new rules took effect on April 1. Netanyahu, who is fighting for a fifth term, has not ruled out full legalization. Cultivation of cannabis for medical use has been legal for more than a decade but is strictly regulated, as is consumption. The government in January gave the final go-ahead for its export, expected to bring in big revenues. There are currently a handful of companies in Israel growing medical cannabis, with many more waiting for licenses. Legalization is just part of Zehut’s unique ideology, which includes far-right positions such as Israel’s annexation of the occupied West Bank and an end to Muslim administration of the flashpoint Al-Aqsa mosque compound in Jerusalem. The compound, the third-holiest in Islam, is known to Jews as the Temple Mount and revered as Judaism’s holiest. He also champions data privacy, seeks to liberalize marriage procedures, and wants police to be more tolerant of non-violent protests. Left-wing party Meretz says it was first to demand legalization across the board and Labour also supports such change, but it is Feiglin who has put a campaign spotlight on the issue. The Green Leaf party has been advocating it for years but its leader, Oren Liebowitz, says he would “not even have dreamed” that it could have stirred such election interest. “In Israel, 27 percent of the public says they have smoked in the past year and 71 percent are in favor of legalization,” he told AFP at a Tel Aviv cafe terrace. His party is not running in this election so that others with a better chance of making it into parliament can reap the benefit of traditional Green Leaf supporters’ votes, he says. Israeli chemist Raphael Mechoulam was the first to isolate THC, the major psychoactive substance in cannabis, and pioneered its medical applications. He was sceptical about imminent change. He added that only a few doctors are authorized to prescribe marijuana for medical use. “It’s a political issue,” said Hagai Hillman, founder and CEO of B.O.L Pharma, a pharmaceutical company that grows and distributes therapeutic cannabis. He says he will never invest in anything outside medical marijuana. “Cannabis is a drug, and it is a dangerous drug,” he said. On a recent day, around 100 people turned out in Tel Aviv to hear delegates from several parties explain their pot policy. Some let off firecrackers while waiting for the speakers. “I am undecided between Meretz and Zehut,” said teacher Eran Shalev, 37, referring to two parties that are political polar opposites. In the crowd was stand-up comic and Zehut member Gadi Wilcherski, who backs Feiglin’s stance on marijuana but admits to ignoring the rest of his manifesto. “You can’t have a nation that constantly goes to war and our children sit in the shelters, and after that they go to the army (for compulsory service),” he said.